Amazing work was done by so many individuals and communities to raise the money needed to build the Denis Hurley Centre. Now we need your help to run the programmes that we have here. A one off donation is very helpful. However, if you are able to make a regular donation, once a month for example, that can be invaluable in enabling us to plan our work. We are registered as a Public Benefit Organisation (PBO 930034301). This means that if you are a South African tax payer (corporate or individual) you can claim a tax deduction for your donation under Section 18a status. If you would like a tax certificate please reference your donation as "18a + your surname”. Then email us at Leanne@denishurleycentre.org with the details of your donation and also your South African address postal or street address. Tax certificates are usually sent out in March/ April after the end of the tax year. Please click the option to send us confirmation to admin@denishurleycentre.org so we can look out for the donation and let you know when we receive it. Remember to include your own email address for acknowledgement. 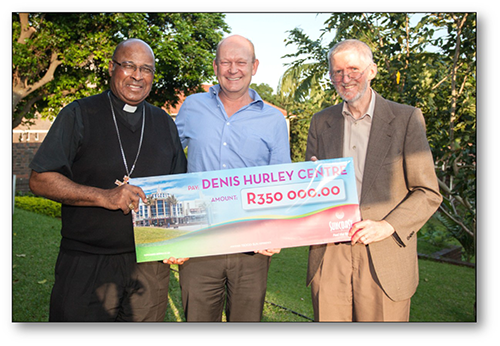 Write a cheque out to ‘Denis Hurley Centre Trust' and send to Denis Hurley Centre Trust, Emmanuel Cathedral, Cathedral Street, Durban 4000. Contribute in cash at the Denis Hurley Centre box in the Cathedral (please do NOT send cash by post).